H4P’s Isper Sabrine was interviewed by the BBC here, and by the Spanish Heraldo newspaper, where he spoke about Heritage For Peace and our SHELTr project here. On the 19 of April H4P, together with CSIC (Spanish national research council) are participating in a Forum in Madrid as part of the their programme as Capital for Peace. Flyers and posters promoting the work of H4P will be on the CSIC stand. See more here. The state of the historic Aleppo souk. Copyright: Amer Rachid for Aleppo Archaeology. Aleppo Archaeology published a new image taken by Amer Rachid showing the damage in Aleppo Souk, available here. 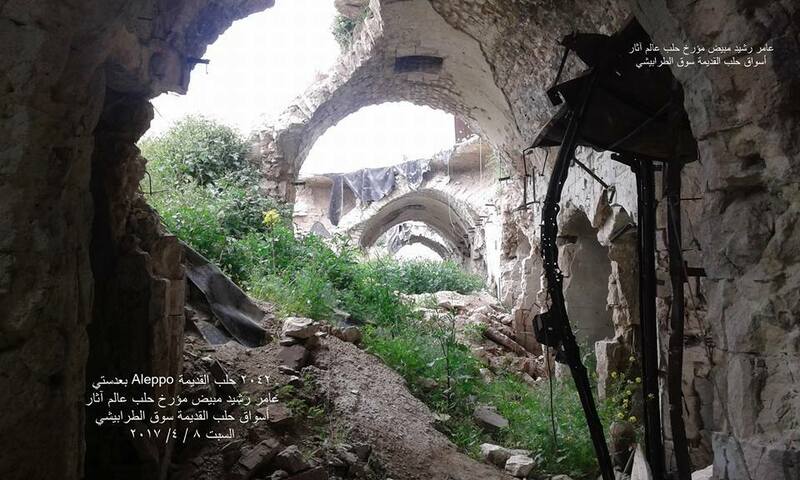 Another image showing the damage in Aleppo Citadel is posted here. According to information received from the Department of Antiquities in Al-Hassaka, the tomb located in Abu Jdari site in the Al-Hol area to the east of Al- Hassaka, was exposed to deliberate sabotage. Read more on the DGAM website here. The Roman Bridge in Shugur was hit in an airstrike, according to this photo by Idlib Antiquities Centre. The Directorate-General of Antiquities and Museums (DGAM) reports that shells fell near the National museum of Damascus, but no damage was sustained. Read more on the DGAM website here. “Jandali’s music integrates ancient melodies from Aleppo and the Silk Road into works that are preserving and presenting the rich musical heritage of Syria.” The concert will be at the Montreal Holocaust Museum. Wednesday, May 3, 2017 at 7:30 pm. More details on the CTV News Montreal website here. The Authority Of Tourism and Protection Of Antiquities in Al Jazira Canton has been renovating the Tell Bayder site. This involves a group of specialists in this field and who have already worked with the mission itself and under supervision of archaeologists and engineers from the Authority and with contribution of archaeological students from the Euphrates University. The Restorations included cleaning floors, raising the ruined walls and dismantling and installing some of walls and plastering it by mud and plaster after removing the old plaster also appointing an observer for the site, available here. The Authority of Tourism and Protection of Antiquities in Al Jazira Canton – Syria published a video about restoration works in Tell Mozan available here. Learn more on the Prensa Latina English site here. The Directorate of Laboratories for Conservation of the DGAM have begun work on documenting and carrying out maintenance on the mosaics that stored in DGAM storage in Damascus. The work also includes the processes of consolidation, drawing and numbering, and then digitising the records. Read more here. A workshop was organized by the French architect Jacques Seigne, who worked in Palmyra and Jerash for many years and with the support of the French consulting company SAWA, represented by François Lastoure, the consultant of the company, with the participation of forty architects, Engineers and Archaeologists from the DGAM and Partners in the city of Aleppo. The workshop focused on the field visits for the damaged archeological buildings in the old city of Aleppo. The purpose of the workshop was to discuss ideas that help to make correct interventions and documentation of damages and develop future scenarios for the restoration of damaged buildings. The Technical Institute of Antiquities and Museums is holding a series of lectures about heritage protection. Read more here on the Directorate-General of Antiquities and Museums (DGAM) website here (Arabic). “Syrian women and their important role throughout history were the focal point of Artist Nabil al-Samman’s exhibition held at Haishoon Art Café in Lattakia” covered on the SANA website here. ICOM and ICMS have released a new E-handbook on emergency procedures, available in English here. It is available in several other languages, together with other useful publications, here. According to Reuters, Italy has won G7 backing for U.N. peacekeeping force for culture. The G7 nations are Canada, France, Germany, Japan, Britain, the U.S., and Italy. The nations committed to pursuing the creation of a U.N. peacekeeping force to protect world heritage sites from destruction in conflict and combating the trafficking of plundered treasures. Read more about the original February meeting here or the April update here. Read the full Sputnik News article here. A projection-debate is being organized by the Association for the Protection of the Syrian Archaeology (APSA) Strasbourg, the Association for the Ancient Near East (ASPOA), the university of Strasbourg and the national library on 25 April. More info available here. Registration is now open for the 41st session of the World Heritage Committee. Krakow, Poland, 2 – 12 July 2017. Learn more and register on the official website here. Melbourne University’s Ian Potter Museum of Art has a new exhibit about heritage preservation and archaeology in Syria. 28 Mar – 27 Aug 2017, with a symposium 11 – 13 August 2017. Read more on the Global Voices article here and on the Ian Potter Museum of Art website here. The University of Leicester and University of Durham invite applications for Research Associates to join the Endangered Archaeology in the Middle East and North Africa (EAMENA) projects in the School of Archaeology and Ancient History at the University of Leicester, and the Department of Archaeology at the University of Durham. Learn more and apply for the the Leicester position here and the Durham position here. The British Museum has created a 3D model of a 3,500-year-old statue of Idrimi – an ancient Syrian refugee who became king. Read more in the Art Newspaper here. Foreign Policy reports on UNESCO’s recent efforts to preserve Syrian culture and heritage. Read the full article here. National Geographic showcased vintage pictures of Syria’s heritage here. “The United Nations International Federation for Peace and Sustainable Development has appointed the former Egyptian minister of antiquities Zahi Hawass as an ambassador for the global cultural heritage.” Read the full Egypt Independent article here. The Penn Museum has posted photos of their new exhibit, Cultures in the Crossfire: Stories from Syria and Iraq. See the photos on Facebook here. Longreads posted “A Trip to Syria, Remembered” here. The Adventure Tribune posted “War In Syria Threatens UNESCO World Heritage Sites” here.